2016 Vietti, Barbera d’Asti DOC “Tre Vigne” Piedmonte, Italy. 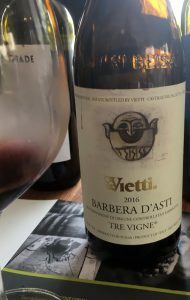 One of the most reliable and delicious red wines on earth, the Vietti Barbera d’Asti Tre Vigne never disappoints with a energy filled palate and a rush of dark fruits it’s one of the best values around. 2016 is turning out to be a thrilling year in Piedmonte for reds especially with sublime Dolcetto(s) and Barbera(s) like this Vietti, it’s deep and ripe in flavor and fresh with exciting acidity. Luca Currado makes some of the best wines in Italy, known for his fantastic Cru Barolo(s), he also, along with Giorgio Rivetti and Giuseppe Vajra does exceptional Barbera as well, these are wines that have raised the Barbera game in recent years. Vietti is a storied winery that dates back to the early years of the 20th Century when it was founded by Mario Vietti, who started bottling wines for himself and focused the family business on the grapes of the region. The biggest rise at Vietti was after World War II when Alfredo Currado, who married into the Vietti family by way of Luciana Vietti, in 1952 starting making wines from single vineyard sources, this was a new idea in Piedmonte’s Barolo zone, he was one of the first to vinify from Cru plots in famous sites such as as Brunate, Rocche and Villero, and he “cru-designated” the wines, also he helped save the local Roero white grape Arneis from extinction, and was later known as the “Father of Arneis”! The Vietti wines come mostly from the Castiglione Falletto vineyards, in the heart of the Barolo zone, these are soulful and remarkable wines that show their terroir and character of sandy-calcareous soil that highlight this area and that gives them unique tannic spine, but with beauty in the nose and lovely elegant details. That said this Vietti comes from the Asti zone with a bit more granite and marl that heightens the perfume and sense of lightness that gives a feline and feminine sensation to the wine with the grapes coming from vineyards in Agliano Terme and several other villages in the hills around Barbaresco.The Tre Vigne Barbera d’Asti is crafted with a cold maceration in stainless steel tank, then Luca fermented the musts for approximately 2 weeks, with gentile daily pumping overs, after which he leaves the wine for an extra week of maceration, then it is racked over to oak for malolactic conversation and raised in a combination of large cask, barriques and stainless barrels for a full 18 months. This makes for a rich and opulent mouth feel and this 2016 while lively, is warm and smooth on the medium/full palate with satiny layers of black cherry, blackberry, juicy plum and spicy/sweet currants in a darkly purple and ruby edged red. Building density as it gets air, this wine is certainly impression in form and delivers a stylish charm that you don’t often see in a wine in this price class adding a vibrant array of secondary elements that includes light wood notes, a mix of florals, mineral tones, a touch of earth and a hint of sweet and sour herbs. I could drink this stuff every day and it’s brilliant with robust cuisine and makes simple dishes shine, it’s a flexible wine that also is absolutely perfect with Fall flavors and Holiday fare, drink often.